This happened several months ago, but I think it’s still worth capturing. “While single-use chopsticks may be a convenient option for restaurant owners and patrons alike, there is a small group of Chinese DIY designers and young environmentalists who are taking initiative to counter their use. One such group called ‘Unigreen’ has made an open offer online to hand-stitch a free chopstick / soup spoon holder for anyone who pledges to only carry reusable chopsticks. Original post on PSFK. 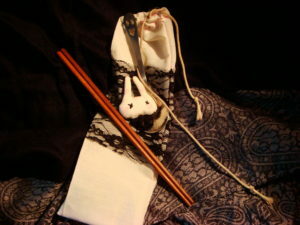 More pictures of chopstick bags from Unigreen’s blog.